The City of Deux-Montagnes wishes to inform the citizens that the organic waste collection is arrived on its territory. The Organic waste collection program aims to meet the requirements of the Quebec Residual Materials Management Policy, which plans to ban from landfills, organic waste composed mainly of food residues and green residues. Deux-Montagne’s residents will receive soon a starter kit at home to participate to the effort in the collection of organic waste. This complete starter kit will include: (1) rolling brown bin, (1) kitchen bin, (1) user guide and others documentations relevant to the day-to-day management of the organic waste collection areas and schedules. Here are the documentations that will be provided in the starter kit. As of March 1, 2019, the City of Deux-Montagnes will be delivered at the resident’s houses and apartment buildings the complete starter kit. Collecting organic waste by the City. 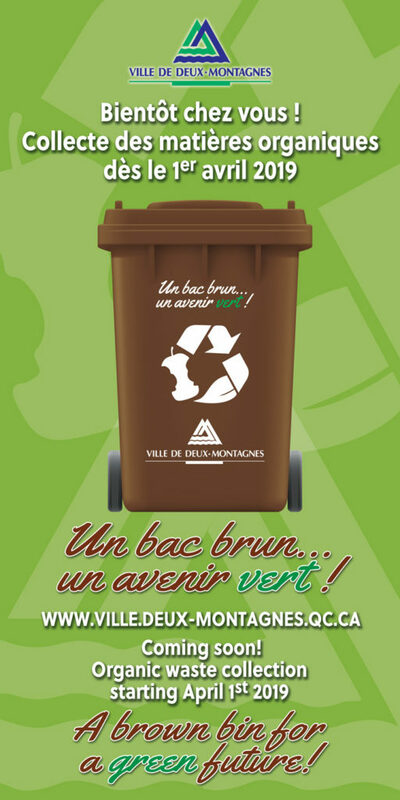 In order to encourage the citizens of Deux-Montagnes to follow suit in the organic waste collection program, the City has established a collection schedule. As of April 1, 2019, a first collection of organic waste is planned on the territory of Deux-Montagnes. For more information regarding this topic, check the home page of the City’s website atwww.ville.deux-montagnes.qc.ca under the tab ‘’A brown bin, a green future’’. The City of Deux-Montagnes is counting on the resident’s participation to achieve the goal to a better management of the residual waste collection on its territory and in the same time to get an healthier life environment for everyone.